Methylene chloride exposure in the workplace: Economical fume extraction solutions - Sentry Air Systems, Inc. The following table outlines regulated and recommended exposure limits to methylene chloride as well as potential routes of exposure and side effects. The International Agency for Research on Cancer classifies methylene chloride in group 2A – Probably carcinogenic to humans. While allocating budget monies towards fume extraction equipment may not be top priority, it is a vital investment to mitigating potential safety violation fees. The upfront cost of a quality fume extraction system is quickly recouped in increased worker satisfaction, reduced downtime, and the peace of mind knowing employees’ health is better protected. At Sentry Air Systems, we design and manufacture high quality fume extraction and air filtration products, and are uniquely experienced in tackling a myriad of chemical vapor applications. Our approach to product design is simple: Make a product that is highly effective, requires minimal maintenance, and is easy for customers to implement into their work environment. It is an added bonus that our products are also competitively priced and feature low energy power consumption. Our line of chemical fume extractors come equipped with granule activated carbon filters that adsorb chemical molecules before recirculating cleansed air back into the ambient room. Specialty impregnated carbon filters are also available for applications involving aldehydes, acid gases, and ammonia. 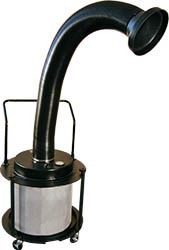 Listed below is a sampling of our chemical fume extractors. We invite you to visit our website to see the full listing. Designed to pull harmful fume and particulate up and away from the operator’s breathing zone and into the filter chamber. This source capture system features a free-hanging, self-supportive flex arm that can easily be maneuvered by the operator to their desired location. Installation is made easy with the included wall-mounting kit. 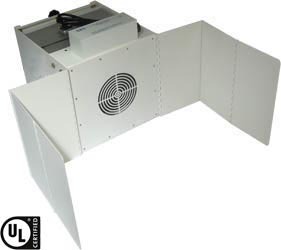 Offers a unique design and horizontal airflow pattern and features adjustable “wings” to assist in directing contaminated air towards the unit’s inlet and into the filter chamber. This design offers hood-like containment with the footprint of a larger hood. 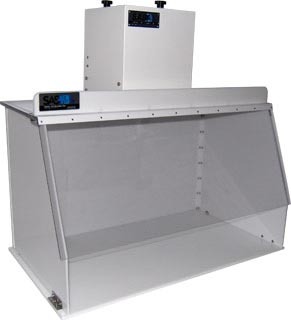 One of our most popular unit, this source-capture fume extractor features heavy-duty locking casters for easy mobility, a flame-retardant and self-supportive flex arm, and high-quality filter media. 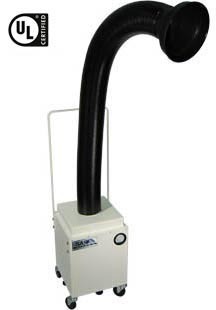 This portable fume extractor comes equipped with a 32 lb. disposable granule activated carbon filter; ideal for high volume applications. The granules work to adsorb harmful chemical molecules and trap them before circulating cleansed air back into the room. SAS commissioned an independent study to determine the effectiveness of our Model 300 Winged Sentry w/ Lid, when equipped with activated carbon filtration, for the collection and removal of methylene chloride vapors. The results of the study found a 92.6% efficiency rate for the removal of methylene chloride from the air. Results based on the experiment described in the full report. For more information about controlling methylene chloride vapors in the workplace, or to receive a quote on our fume extraction equipment, please call 800.799.4609, email sales@sentryair.com, or fill out the feedback form below. A technical sales representative will contact you to discuss your application and recommend a solution.